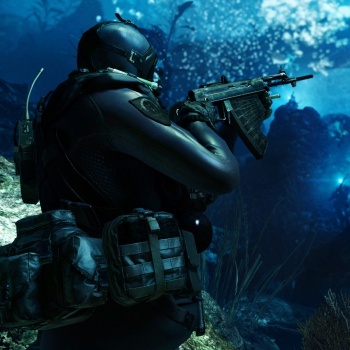 Call of Duty: Ghosts Visual Difference Is "An Individual Call"
Infinity Ward Executive Producer Mark Rubin says some gamers may notice the lower resolution of Call of Duty: Ghosts on the Xbox One, and some may not. Infinity Ward confirmed last week that the PlayStation 4 version of Call of Duty: Ghosts runs natively at 1080p, while the Xbox One edition is 720p, upscaled to 1080p. The response was actually rather more muted than I expected (which is to say, nobody got knifed, and bravo to everyone for that) but there's no getting around the fact that in terms of raw pixels it's a fairly substantial difference, and in terms of "which one is better" it doesn't look good on Microsoft. According to Rubin, however, the difference isn't all that great, if you even notice it at all. "If they're running side by side, some people will [see a difference], some people won't. The 720 on Xbox One is upscaled to 1080p as far as resolution is concerned - some people have noticed and some people haven't. I think it's an individual call. Maybe it's a close call and maybe it's not for some people. It really depends on how hyper-aware you are of things like that," he told Edge. Rubin said the game will look great regardless of what system it's on and claimed that Infinity Ward has "never done, specifically, a comparison of any sorts." And although the lower resolution on the Xbox One was forced by the need to keep the game at 60 FPS, he refused to say that means that the PlayStation 4 is a more powerful console. "This is the first game on the console and there's a lot for us to learn with the new hardware so it's a long-running process - you compare COD 2 to COD 4 it's a massive leap forward in graphical fidelity. So I think we expect the same thing on both platforms," he said. "And it's not just hardware physically, the amount of resources that each system is allowing the game developers to use isn't the same. So from our standpoint that's something that could change, y'know? We might get more resources back at one point. And that could make things change dramatically for the Xbox One, for instance. It's a long complicated road that will take years to develop, and I think at the end we'll have games looking very similar, usually, on both systems." So there you have it. Maybe it looks better and maybe it doesn't, and even if it does look better that doesn't necessarily make it better, and it might not be better later. Got it? Call of Duty: Ghosts comes out on November 5 - holy crap, that's tomorrow!